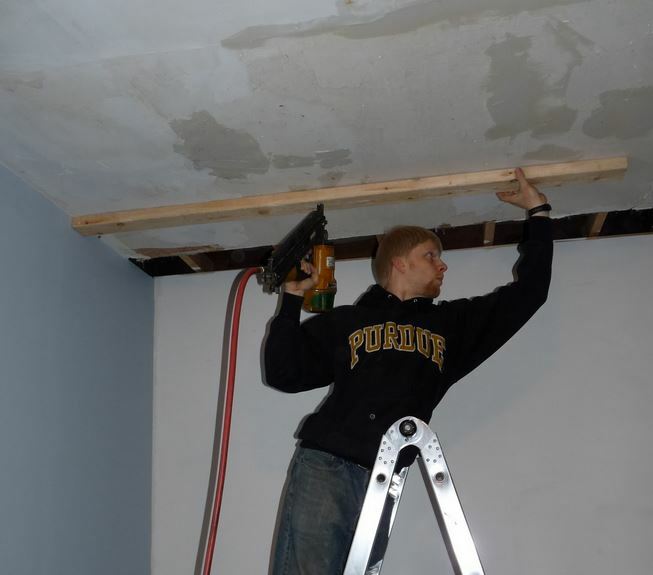 When there is sheet rock on the ceiling there are two ways to connect the floor to the shear wall: remove a strip of plaster or sheet rock 12-18 inches wide and use conventional shear transfer ties, or use lag bolts. The dark brown part of the photo is where the plaster has been removed. This is where top of the wall and the floor meet. With the plaster removed the cripple wall can be attached to the floor with conventional shear transfer ties. At other times we are able to drive lag bolts up through the top of the shear wall into the floor joists. 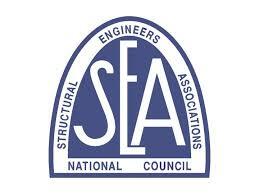 These lag bolts attach the floor to the shear wall and secure it from sliding. If we remove plaster or sheet rock from a wall this is quite handy when there is plaster or sheet rock on the ceiling because there will be no need to remove it as illustrated in the first photo above. 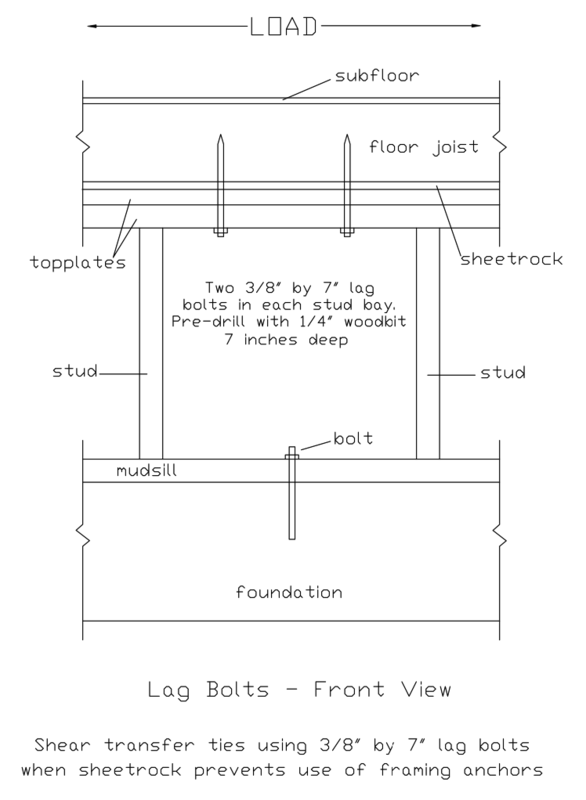 If for some reason there is no accessible floor framing above the cripple wall for the lag bolts to bit into it will be necessary to remove the ceiling and use conventional shear transfer ties. Here you are looking at someone driving a lag bolt up through the top of the cripple wall and into the floor framing. This joins the top of the cripple wall to the floor framing. When the floor moves, that movement is transferred to the top of the cripple wall. 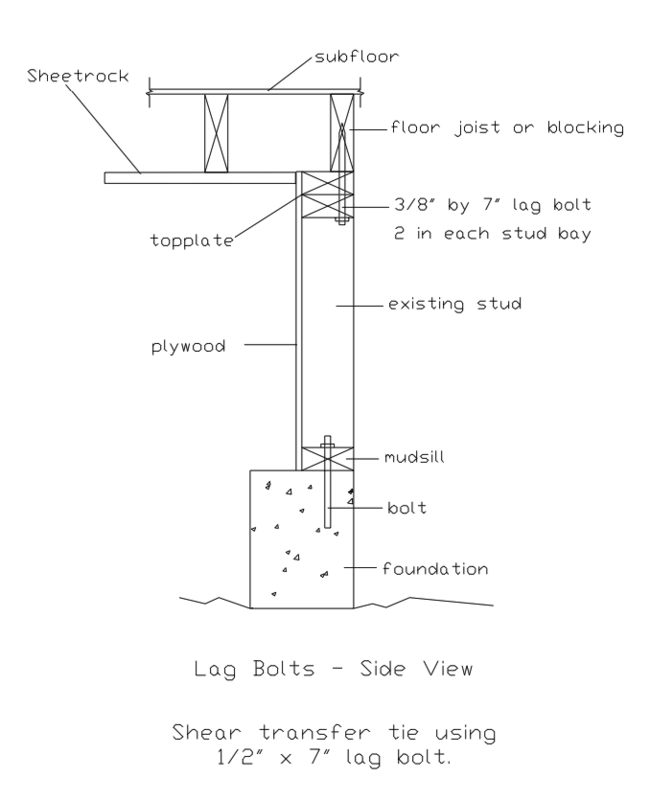 If the cripple wall is braced with plywood and the floor is attached to the cripple wall with the lag bolts, the floor will not move and the house will be saved. t This is very handy when sheet rock is on the ceiling because one does not need to remove any of the sheet rock on the ceiling to access the floor framing. 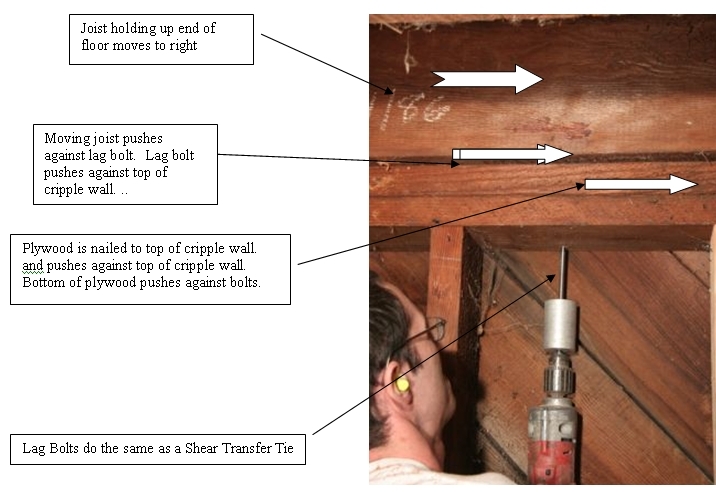 The drawing below shows how a lag bolt can do the same thing as a shear transfer tie without removing the plaster. Here you are looking at it from the end. This is the same thing looking straight on. “Load” means earthquake force.